Before their big performance, Chloe x Halle Bailey posed together as always on the red carpet for the 2018 MTV Movie & TV Awards yesterday evening(June 16th) at the Barker Hanger in Santa Monica, CA. Both ladies were wearing MARC JACOBS SPRING 2018. Chloe Bailey wore a sleeveless green & pink sequin floral, calf length dress featuring a mock neckline & a tie waist and a black turban. She finished up with a flawless make-up look and silver accessories. Halle Bailey wore a red, yellow & green sequin one-shoulder jumpsuit with a flower embellished shoulder and harem inspired pants. If this looks familiar, that's because Jaime King wore it in October 2017. However I thought she looked better in it. A flawless beauty look and SOPHIA WEBSTER sandals finished up her look. My only quibble is that I wish they left the gloves out, however they still looked great. 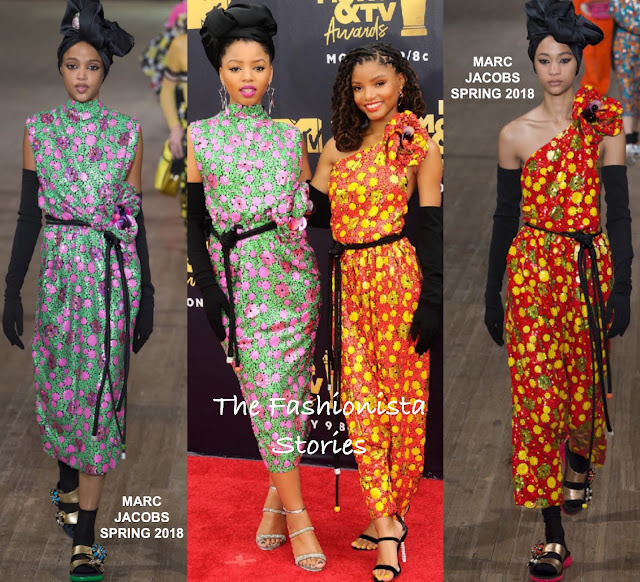 What do you think of Chloe & Halle's MJ looks?